Coconut Cream Cupckes | Stay Calm, Have A Cupcake! Coconut is the type of food that people either LOVE or HATE! I fall on the LOVE side of the argument. I love everything about coconut, from the texture, to the flavor, to the smell. I can’t get enough of it. 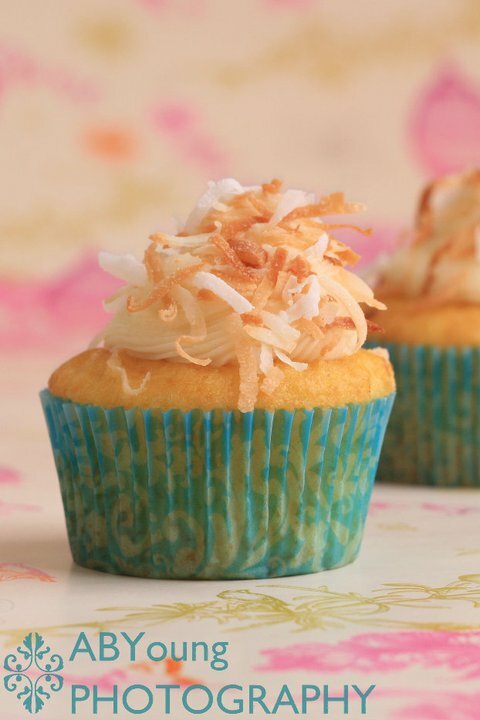 If you are like me, then this cupcake is the perfect way to indulge in your coconut obsession. A moist coconut cupcake filled with milky coconut cream, and topped with vanilla buttercream and toasted coconut flakes. Divine! Preheat oven to 350 degrees. Line two standard 12-cup muffin pans with paper liners; set aside. In the bowl of an electric mixer fitted with the paddle attachment, beat butter and 2 cups sugar until light and fluffy, 3 to 4 minutes, scraping down sides of the bowl as needed. Beat in vanilla. With mixer on low speed, add flour mixture in three parts, alternating with the milk and beginning and ending with the flour; beat until just combined. Transfer mixture to a large bowl; set aside. In the clean bowl of an electric mixer fitted with the whisk attachment, beat egg whites on low speed until foamy. With mixer running, gradually add remaining 1/4 cup sugar; beat on high speed until stiff, glossy peaks form, about 4 minutes. Do not overbeat. Gently fold a third of the egg-white mixture into the butter-flour mixture until combined. Gently fold in remaining egg-white mixture; stir in shredded coconut. Divide batter evenly among the muffin cups. Bake 20-23 until the cupcakes are golden brown. Add to the mixer 5 tbs of heavy cream – beat until you get it to the desired consistency. You want it thick, but not too stiff. Add is the coconut flake and beat until well mixed. For toasted Coconut Flakes, simply heat your oven to 350, spread the sweetened coconut flakes out evenly on a cookie sheet and bake for about 5 minutes. Keep a close eye on them though, they burn quickly! Use the toasted flakes to top your delicious cupcakes. Share with some friends and enjoy! Yummmmm. Love the coconut cream frosting! Wish I could have one rt now! Yum Yum Yum. Made my mouth water. My husband I love coconut so much we had a coconut wedding cake. This sounds unbelievable. Will have to try it!! Thanks for stopping by 🙂 Enjoy the recipes!